It's Showtime for Avengers: Infinity War | Kid Reporters' Notebook | Scholastic Inc. The long-awaited Avengers: Infinity War arrives in theaters nationwide today. Already, it is on track to be one of the biggest money-makers in movie history. The science-fiction fantasy from Marvel Studios picks up two years after the events of Captain America: Civil War. Iron Man, Thor, and the other Avengers must come together to prevent Thanos from destroying half the universe. 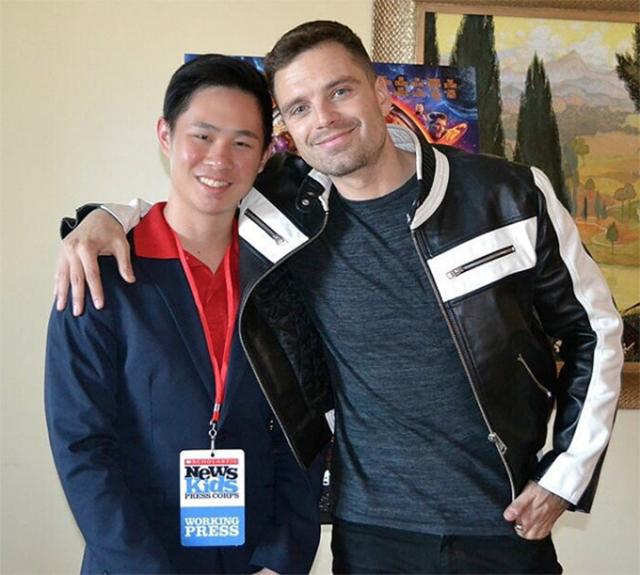 At a press conference in Beverly Hills, California, on April 22, I had the chance to talk with Sebastian Stan, who plays the role of Bucky Barnes. I also spoke with Winston Duke, who plays M’Baku, the leader of Wakanda’s mountain tribe, the Jabari. The actors researched their characters, they said, by reading the Marvel comics on which the superheroes are based. The film ties together plot lines from a decade of Marvel blockbusters, including Black Panther. Stan talked about the evolution of Bucky, whose full name is James Buchanan Barnes. In the comic-book universe, his troubles date back to the 1940s, when he enlisted in the war. With a new beginning in the mythical kingdom of Wakanda, Bucky gets to show another side of himself, uniting with the Avengers to defeat Thanos. “It’s about cultivating new relationships and a sense of place and family in Wakanda that he didn’t have before,” Stan said. Infinity War, which is the third movie in the Avengers series, is unlike any previous Marvel production. With a large, diverse cast and generations of superheroes, it is one of the most ambitious and expensive movies ever made, with an estimated cost of $300 million.